post Oracle offers two Endeca solutions. In this post I would talk about Oracle Endeca Commerce solution. This post is a brief overview of all the important packages of Oracle Endeca Commerce. If you are in a hurry then you can scroll down take a look at the mind map. There are four major components in Oracle Endeca Commerce. There are four important components in Oracle Endeca Guided Search. MDEX is a hybrid search and analytical database designed for analysis of diverse, large, rapidly changing data which could be in structured or unstructured format. Four important components are packed in the Oracle Endeca Platform Services. The Endeca Control System provides a way to control and administer your Endeca implementation. [as per official documentation] Other than the above mentioned four components, platform services also gives us reference applications like Discover Electronics. It also provide a utility named “emgr_update” to upload/download Endeca instance configuration to/from Workbench. Presentation API is the interface between your application and the MDEX engine. Presentation API let your application to query Oracle Endeca records from MDEX engine. Presentation API is available for Java and .Net. Oracle Endeca Tools and Framework is a collection of tools and libraries for seamless content presentation across channels. Oracle Endeca Workbench is web application which gives ability to the business user to access, configure and manage components like Experience Manager, Rule Manager, Dimension Order, Keyword Redirect, User Management, Thesaurus, Daily Reports and Admin Console. There are three optional packages in Oracle Endeca Guided Search. The Endeca Content Acquisition System is a collection of components to add, configure, and crawl data-sources like Content Management Systems, Custom Format Data, Web Content and File System. CAS crawl data and convert it to Endeca records. Oracle Endeca Rapid Application Development Toolkit for ASP.Net provides a set of web service controls to build Oracle Endeca applications. Oracle Endeca Experience Manager is the new name for Endeca Page Builder. Experience Manager get installed as a component in the Workbench. As of today you need a separate license for Oracle Endeca Experience Manager. More details can be found in this link. Refer this post to install Experience Manager in Windows. I will be writing more on Oracle Endeca Experience Manager and Assembler API in the coming days. Oracle Endeca for Mobile provides an integrated cross channel consistency in delivering your products and services to your clients. You can find more from the official documentation. Oracle Endeca for Social is the latest edition in the Oracle Endeca Commerce product line. Endeca for Social provides connectors to ingest data from social networking site Facebook. It also gives us capability to hook to Facebook OpenGraph using Experience Manager cartridges. You can find more from the official documentation. 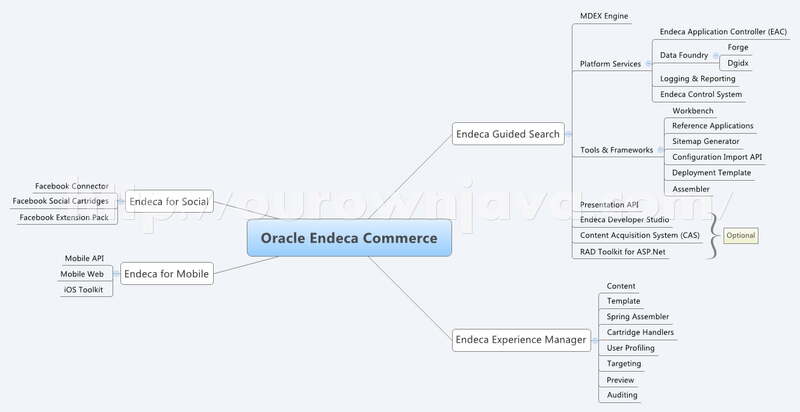 Fantastic work on Oracle Endeca Commerce Solution Mind Map. You are right although there is enough documentation available but it takes time to understand the big picture. But this really helps to relate the things we learn through documentation. This’s Sai, I need to learn Endeca from online. If possible, Could you please tell me how to? Oracle Endeca Commerce allows the right content is delivered to right customer to encourage clicks and drive business results. « Separate unit and integration testcases using JUnit Category.